In her book Little Michigan, Kathryn Houghton takes a nostalgic look at Michigan’s smallest towns; today, she takes us to Ahmeek, home to the last manned lighthouse on the Great Lakes. inn at the lighthouse, which is now listed on the National Register of Historic Places. Like many towns in Michigan’s western Upper Peninsula, Ahmeek, part of Copper Country, was first settled due to the mineral deposits in the area. The first mine opened in 1902, and the Ahmeek Mining Company began building five-room homes for miners in 1904. The cost of building one of these early homes was $95. In 1907, the village hall, containing a jail, a courtroom, and offices, was built, and the village began to take shape. The village was incorporated two years later in 1909 and held its first elections in March of that year. Maurice Kenel was elected the first village president. With the success of the nearby mine, the village grew quickly. By 1910, the census recorded 760 people living in Ahmeek. As Ahmeek grew through the success of the mines in the early 1900s, area miners began to push for unionization. 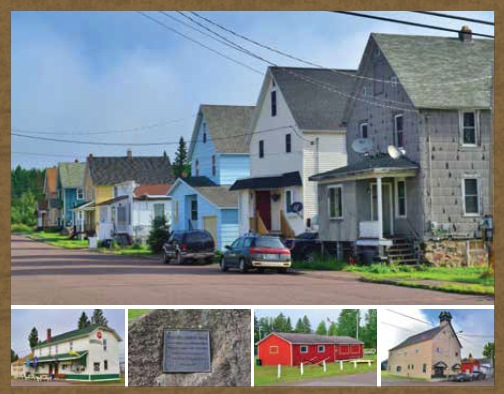 Like many mining towns in the Upper Peninsula, Ahmeek was home to people from a variety of European countries, including Ireland, Finland, Poland, Sweden, Russia, and Hungary. The cultural and linguistic differences inherent in the international communities made unionization more difficult, particularly when faced with the opposition from the mine bosses. Growing tensions throughout Copper Country, particularly in nearby Calumet, boiled over into the Copper Miners’ Strike of 1913 and 1914. Thousands of miners throughout the region, including many in Ahmeek, went on strike to protest wages and working conditions, and many women in the area protested alongside the men. The strike, however, was accompanied by multiple acts of violence, including the Italian Hall disaster in nearby Calumet when someone shouted “fire” at a Christmas event. There had not, in fact, been a fire, but the panic that ensued led to a stampede that caused the deaths of 73 people, most of them children. In Ahmeek, strikers fired on a train of detectives hired by the mining companies and set off an explosion at a smokestack at the Ahmeek mine. Numerous officials bemoaned the lack of law and order, but Judge Patrick O’Brien, who presided over cases related to the violence, noted that while the strikers were violating the law, the mining companies had done little to calm the situation and had instead acted in ways that had increased the “bitterness and hostility.” The strike continued until early spring of 1914, and one factor in its end was the lack of funds for strike relief—money that was provided to strikers to support them while they were not collecting wages. A vote to end the strike was held on April 12th; in Ahmeek, 600 of the 617 votes cast were to end the strike. The official end of the strike did not end tensions, however, though community members in Ahmeek worked to put the strike behind them. Ahmeek’s boom years faded with the decline of the copper industry, which suffered in the 1920s, and the Great Depression shook the industry still further. The Ahmeek mine closed in 1966. The decline in mining coincided with a decrease in population in Ahmeek, but the village was determined to hold on. Entrepreneurs attempted a variety of business ventures in the town, including an ice-cream factory, an ice company, a meat market, multiple grocery stores, a restaurant, and even a shop that sold agates. Some of these businesses, such as the meat market and the agate shop, were successful, while others were not.